I went to my daughter's house to spoil the grand kids last week and she had made a wonderful breakfast. 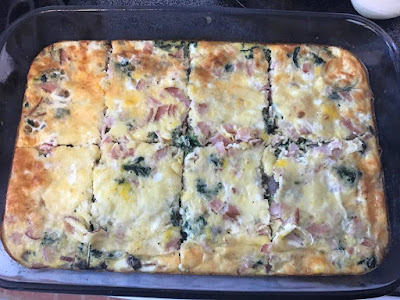 While the kids had pancakes I sat down to this delicious breakfast casserole! I need to visit in the mornings more often! She isn't afraid to branch out and try new things. 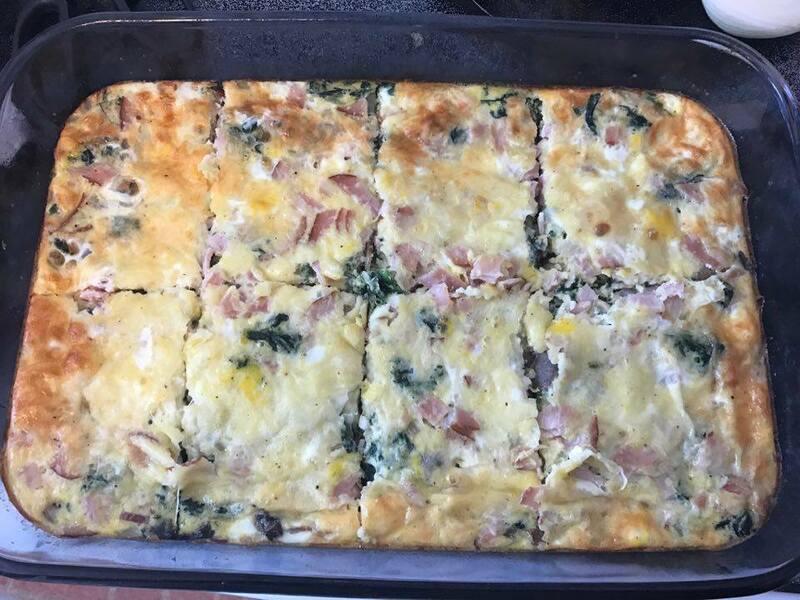 I think why I loved this casserole because it was something different for me and took me out of my comfort zone. Then of course I thought it was delicious. She was so excited that I loved it she agreed to let me post it today. Preheat oven to 375 Spray a casserole dish with nonstick spray. In a skillet saute onions, mushrooms, and garlic. Take off heat and add spinach (or broccoli) and mix together. Pour into the casserole dish and spread evenly. In a medium bowl, whisk together the eggs, eggs whites, milk, Parmesan, salt, and pepper. Mix in mozzarella cheese and Canadian bacon (or ham) and pour over vegetables. Bake until a knife inserted in the center comes out clean about 30 to 35 minutes. Wait 5 minutes and cut into 8 pieces.